The planet Mars and the star Regulus, the brightest star in the constellation Leo, highlight their conjunction this evening. Two heavenly bodies are said to be in conjunction whenever they stand north and south of one another. Tonight, Mars and Regulus shine about a pinky-width apart. By all means, look at the evening couple through binoculars or low power on a telescope. The contrast of color makes their partner’s coloration all the more conspicuous. Note how ruddy Mars brings out the sparkling blue-white hue of Regulus. View the evening couple while the time is at hand, for Mars will not be hanging out in this part of the starry sky for long. By the end of June 2010, Mars will have moved more than one fist-width away from Regulus, on its way toward the planet Saturn. Mars and Saturn will be in conjunction on August 1, 2010. 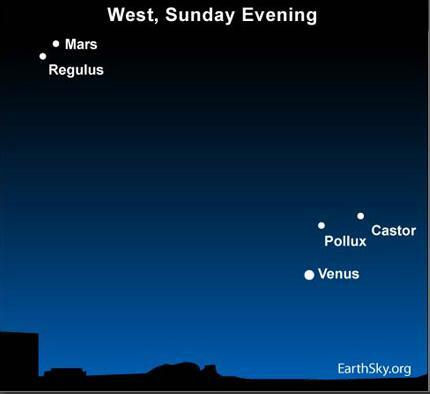 Of course, there is a much brighter planet in tonight’s evening sky, near the stars Castor and Pollux. That is Venus, outshining Mars by a hundredfold. This world ranks as the third most brilliant body in all the heavens, after the sun and the moon. Venus will be in conjunction with Regulus on July 9, 2010. Site contents copyright © 2019 Recorder Online	except as noted. All rights reserved. | 88 queries in 3.212 seconds.